Game Mastering is an art that demands a lot of time and thought from those that would take on the task. And one of the more time-consuming tasks, at least for me, is session prep. Laboring in front of a computer, compiling my notes, constructing the story, making sure I have everything I could possibly need in front of me. And that is what makes it take so long: everything I could possibly need. Because it’s not a matter of what I will likely need–it’s that I try to cover every contingency. And further, I have this vague idea in the back of my mind that someday, perhaps after I’m gone, someone else is going to read these notes and they will need to experience the full effect of my game mastering prowess. The core message of Never Unprepared boils down to keeping things simple. It’s life-hacking meets game mastering. Assess your game mastering techniques. What are your weak points? Include information in your notes that shores up these shortcomings. What are your strengths? Then don’t waste time and space shoring up things you’re already strong in. 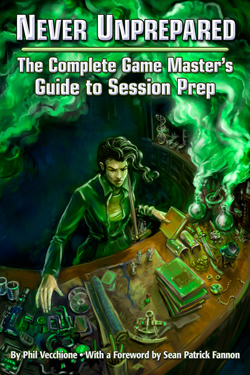 Each chapter ends with a series of useful assessments that game masters can use to think about where they’re at and what they really do. In many ways this book is what a former supervisor of mine called a BFO–a blinding flash of the obvious. But while the advice is simple and seemingly obvious, there are many game masters out there that desperately need to hear it. And just because it’s simple doesn’t mean that it’s not important. In fact–that’s the point. This advice is simple and basic and, most of all, necessary. If you’re a game master of any level of experience, I encourage you to check this one out.